Some folks are beginning to realize that classic 2D animation has a charm and visual appeal that is unique. One of the giants of Disney Animation, Mark Henn, has given an interview about the upcoming 2D animated feature on A.A. Milne’s classic Winnie the Pooh. 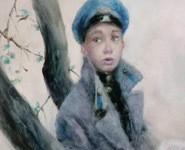 Classic animation techniques work best with these characters and in evoking the sensibility of the famous E.H. Shepard illustrations contained in the original books. “We didn’t have any great debate here,” Henn says. Doing it by hand is almost always the best way! Hayao Miyazaki and his Studio Ghibli have released their first feature length animation in four years, Ponyo on the Cliff by the Sea. It’s a mystery at Darling Dimples why we haven’t posted about this animation giant before now. The work from this studio is held in the highest esteem by Dimples. Ponyo on the Cliff by the Sea is the latest beautifully rendered theatrical animation form Studio Ghibli. Miyazaki said that his inspiration for the story came from Hans Christian Andersen’s The Little Mermaid. Here’s a trailer from the movie but, be forewarned, the song is one of those tunes that will haunt you for the rest of the day. Another surprising omission was the Israeli animated documentary Waltz With Bashir, which had critics cheering from Day Two, when it was unveiled, up to the announcement of the awards. At the post-Palmares press conference, Penn acknowledged that he wasn’t pushing for Bashir, since there were so many other films that “called out and provoked us in a new way.” He added, “I think it will find its audience without us,” suggesting that the Jury wanted to give affirmative-action pushes to luminous films in need of the worldwide attention a Palme d’Or can bring. I translate this as animation isn’t serious film. Frankly, Dimples thinks this stinks. It’s that time of year again. It’s time to review the films nominated for best animated short. First, a few small digressions. Dimples has been quite slack about posting and maintaining this site during the past six months. Please bear with us. We have a backlog of links to add and we will be posting more regularly. A spate of medical problems are behind the laxity but all seems to be well now. Also, we want to comment on the nominees this year for feature length animated film. Ratatouille will win and it is the best film by far but, being 2-D fans, Dimples wants to know why the Simpson’s Movie was not nominated. What’s with that? Now, on to the nominees for best animated short film for 2007. I Met the Walrus is a Python-esque animated short by Josh Raskin with impressive pen and ink drawings by James Braithwaite. 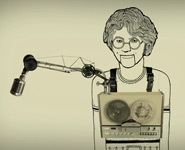 It’s an animation of an interview with John Lennon conducted by Jerry Levitan. It has an interesting style and the interview is historically interesting but it is not interesting animation. It’s not 2D and it’s more than 3D. It’s very good. The biography of the creators says this is their first professional animated film. That’s hard to believe. 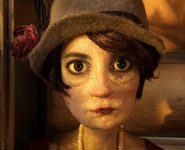 Chris Lavis and Maciek Szczerbowski have recently completed their first professional film, Madame Tutli-Putli, produced by the National Film Board of Canada. In addition to their role as filmmakers, Chris and Maciek wear many hatsâ€”as animators, sculptors, collage artists, screenplay writers, and art directors. 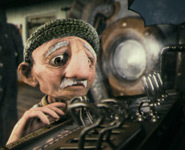 In 1997 they founded Clyde Henry Productions, a Montreal-based film and production company specializing in multimedia, stop-motion animation and visual effects. They have received acclaim for their award-winning illustrations, music videos and broadcast design, and provoked a cult following for The Untold Tales of Yuri Gagarin, a serial comic strip published in Vice magazine. Is it just me or does it look like these guys haven’t slept in years? This is a beautiful film with beautiful storytelling. If you’ve visited Dimples before you know that we value storytelling above all else and this movie delivers. Unlike the previous entry, this effort was supported by a big crew of professional animators. Dimples loves this film on many levels. WE LOVED the french automobiles. Those creatures have more character than most animated characters from the big studios. Finally, something approaching 2D animation. Alexander Petrov is an animation god. He’s someone that should receive more press. He brings great art to his storytelling employing an animation technique known as “painted on glass”. You may have guessed that this is the film that Dimples enjoyed the most. It’s beautiful in every way. The art has a quality that is beyond even the ambition of the other nominated films. The only negative for us was the soundtrack. It was not as artfully done as the animation. Finally, this seems to be the favorite to take home the Oscar. 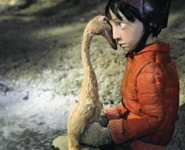 This is a slick professionally made film based upon a classic story told with artful tenderness. The makers of the film have come up with a few twists on the old tale making it fresh. It’s interesting to contrast the soundtrack on this film with the previous nominee. The soundtrack is appropriate and supports the animation and story in an unobtrusive manner. That’s not easy when dealing with a musical masterpiece. Overall, Dimples was disappointed that there were no films nominated this year that felt like Badgered did a few years back. It was fresh and funny. Madame Tutli-Putli comes the closest to that fresh feeling but it’s not quite there. Watch the clips and pick your favorite. Enjoy.